There are hundreds of structurally deficient or functionally obsolete bridges in the state of Iowa. 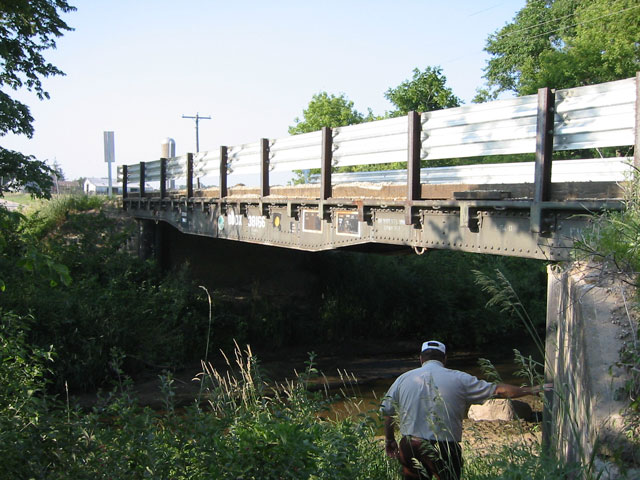 With the majority of these bridges located on rural county roads where there is limited funding available to replace the bridges, diagnostic load testing can be utilized to determine the actual load carrying capacity of the bridge. One particular family or fleet of bridges that has been determined to be desirable for load testing consists of single-span bridges with non-composite, cast-in-place concrete decks, steel stringers, and timber substructures. Six bridges with poor performing superstructure and substructure from the aforementioned family of bridges were selected to be load tested. The six bridges were located on rural roads in five different counties in Iowa: Boone, Carroll, Humboldt, Mahaska, and Marshall. Volume I of this report presents diagnostic load tests on the superstructure of the six bridges. The results of the diagnostic load tests were used to calibrate analytical models of the bridges for rating purposes. All of the bridges were independently rated by three rating agencies using a codified approach. Those ratings were then compared to ratings calculated using a bridge model calibrated to the actual response of the bridge due to the load test. The calibrated bridge model was then used to rate the bridges and determine whether an increase in the initial codified bridge ratings was feasible. Volume I of this report focuses on evaluating the superstructure for this family of bridges. This volume discusses the behavior characteristics that influence the load carrying capacity of this fleet of bridges. In particular, the live load distribution, partial composite action, and bearing restraint were investigated as potential factors that could influence the bridge ratings. Implementing fleet management practices, the bridges were analyzed to determine if the load test results could be predicted to better analyze previously untested bridges. For this family of bridges it was found that the ratings increased as a result of the load testing demonstrating a greater capacity than determined analytically. 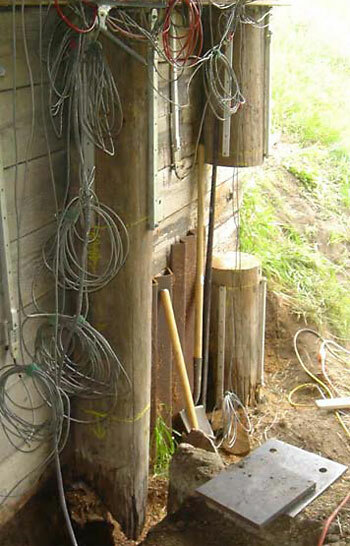 Volume II of this report focuses on evaluating the timber substructure for this family of bridges. In this volume, procedures for detecting pile internal decay using nondestructive ultrasonic stress wave techniques, correlating nondestructive ultrasonic stress wave techniques to axial compression tests to estimate deteriorated pile residual strength, and evaluating load distribution through poor performing timber substructure elements by instrumenting and load testing the abutments of the six selected bridges are discussed. Also, in this volume pile repair methods for restoring axial and bending capacities of pile are developed and evaluated.